Agents as consultants when you want to self-publish? I’ll be very surprised not to find this in my future. When I eventually go for self-publishing, I will not want to figure everything out myself — if there’s somebody who knows what’s what, and how to, I’ll gladly pay them a percentage. You know, they only sent me an e-copy of Blackout? And it is really the first half of the book. I see why the actual nomination is for Blackout/All Clear: because Blackout has no ending — not even a vague gesture toward the idea of an ending. Phooey. Now I need to buy a copy of All Clear, pronto, so I can find out what happens! This is a time travel story, of course: historians go back in time to study things. I like the VERY NARROW studies they do, that seems so realistic! Like a tiny snapshot of evacuated children in one particular manor in the country, for example. I liked this book a lot, though for me it was sloooow to get started. Normally I don’t mind a slow pace, but it took a while for me to start to care about the characters. It has a lot of point of view characters — five — two important, two medium, one minor — which would probably be why it was a slow-starter for me. But it also sets up an interesting contrast with The Dervish House. Why did the large number of characters work for me here (eventually) whereas I just quit reading The Dervish House? I think the answer is simple: Willis gives each point of view character more space — that is, more pages in a row before switching to the next character. That gives me a chance to connect to one character before switching to the next. Also, she places each character in a small-scale, intimate setting: dealing with the godawful children in the manor, looking for a job in a department store during the Blitz, like that. Each situation is easy to understand, and it’s easy to imagine yourself in the place of Eileen or Polly or Mike or whoever. And those places are stressful! You start to really WANT to know how Eileen is going to cope with the mother of those godawful children, how Polly is going to manage when she can’t get a black skirt — trivial, but it all seems to matter. Willis ramps up the stress level with virtually every chapter. The kids have measles, so Eileen can’t get to her drop site. Now she finally gets to the drop site, but it doesn’t open! She has to go to London (encumbered by the godawful children) and find Polly, only she doesn’t know which department store to look in and SHE’S not the one who knows when and where each bomb will fall . . . and so on. By the end, Eileen and Polly and Mike have at least found each other (whew!) but nothing has been resolved. I have some predictions! I bet other historians from the future are thick on the ground. Marjorie, for example. The vicar, quite possibly. Sir Godfrey, definitely — I think he’s actually Colin. Anybody want to bet? No fair reading All Clear first! So I’ve definitely got to buy All Clear. Now gotta think about reading the rest of the short-form nominees . . . I do TRY to read the award nominees if I’m going to be voting on ’em. I try hard! Especially the novels! Luckily the Hugo people help with this by sending you an electronic packet with all the nominees in pdf form, if you’re eligible to vote. Yay! The Dervish House, which I haven’t read yet. BlackOut / All Clear, which I haven’t read yet. Cryoburn, by Lois McMaster Bujold, which of course I preordered and read the moment it arrived. I enjoyed it, naturally, but it’s not my favorite of her Vorkosigan books and I won’t be voting for it. The Hundred Thousand Kingdoms, which I loved loved loved and I will vote for it unless one of the others knocks my socks off even more than this one did, which I don’t expect but who knows? The explanation for the zombies was clever, the zombies themselves well done. I’m not a zombie fan, but I really liked how Grant handled hers. Characterization and voice was excellent. It would never in a thousand years have occurred to me to write a book about bloggers covering a presidential campaign — whoa. Grant did a great job, a *fantastic* job, with the near-future tech and with the close-up of the political campaign. I had some problems with this book, but I will DEFINITELY be buying the sequel. One — the main bad guy was VERY VERY obvious. The moment this guy walked on stage, I was like, Hello, here is the bad guy! And it kept getting more obvious until I decided that maybe Grant was pulling a fast one and REALLY the bad guy would turn out to be a shocking surprise. Well, no. That really was the bad guy. The protagonist of this book, Georgia, is supposed to be so very very competent, and that’s exactly how she comes across, except honestly, it makes anybody look stupid when something is so crystal clear to the reader and yet the protagonist doesn’t get it until it’s spelled out in flaming letters ten feet high. And Two — look, I’m only a casually religious person, okay? But I am nevertheless offended by the stereotype of religious people as either useful idiots or else as narrow-minded bigoted crush-your-enemies repressive EVIL dudes. Frankly, the use of this stereotype made me simply not believe in the bad guy. I rolled my eyes every time he opened his mouth, and twice as hard during his big final speech. So, doesn’t begin to kick The Hundred Thousand Kingdoms out of first place for me. But! I really really honest DID enjoy Feed very much, and I WILL be buying the sequel! Got the second rough draft of the current WIP done! That means I’ve done the first cut (I cut 47 pp) and also taken care of the 30+ notes-to-self to fix continuity etc, which added back about 6 pp. The story’s now about 123,000 words, which isn’t bad. I’m sure I’ll wind up doing a final cut and knocking it down a bit more, but this is good for now. The accumulated clean-up notes are sometimes totally trivial: if somebody uses a knife in the last scene, she’d better HAVE a knife in some earlier scene. That’s easy: find a place to insert the knife, put it in, all done. Then there are the trivial-but-annoying fixes: does everyone who’s supposed to have an accent have one all the way through the story? Checking this means reading over every single scene a character appears in all the way through. You don’t want to overdo the references to the accent, either, so you have to evaluate each scene to see if the references to the accent, if any, seem appropriate. Same sort of thing with physical description: too much? Too little? Does that character have blue eyes all through, is that one consistently bald? Same again with the physical description of the landscape: don’t want to bog things down, but I want to do enough description to put the reader in the scene. This sort of checking is so VERY VERY tiresome. It’s this sort of thing that makes me bored with the manuscript by the time I send it off for a second opinion. Luckily I get un-bored as time passes, so when someone requests revisions, that’s not usually such a trial. Then there’s the need for re-checking big, important aspects of the book. Oressa’s relationship with her father is not the same as Gulien’s. Relationships have to stay consistent, or change in appropriate ways, as the story unfolds. If I reinterpret one character toward the end of the book, then I have to go back through and smooth that out from the beginning — initial scenes with that character may have to change, everyone’s relationships with that character may have to be tweaked — lots of decision making and judgment calls. This is not as tedious, but it is hard. At the end, I routinely wind up not sure whether the characterization works. This is a big, big reason I need another opinion. Like in the Griffin Mage, Book 2: I couldn’t tell whether the relationship between Gereint and Beguchren worked. It was supposed to be a subtle relationship, but it’s central to the story and very important and it was harder than putting in a romance because you know the reader understands how romances work and will “fill in” the appropriate emotions, but a subtle nonsexual relationship between two men? You have to do it all yourself because that relationship could take so many different shapes. So the notes that are left? They are permanent notes about conflicts and relationships. Those notes never go away, because I refer to them over and over as I do the final revision. And then I hope my second readers tell me how great the characterization is. Always a relief when I hear that! AND! Taking a break now, because I’m dying to read the rest of Marsden’s Tomorrow series! I hope the rest of them arrive TODAY! I can talk myself into thinking the characterization works or doesn’t work — I can talk myself into and out of both beliefs in a surprisingly short period of time — so it’s extremely helpful to have an objective reader tell me that Yes, it’s fine; or No, they can’t see that character acting like that in this scene. Take a look at the current WIP, if you like. This should be just about exactly the final draft; I find that for me, the beginning doesn’t usually change much as it passes from my hands through my agent’s and an editor’s. Presuming it gets an editor’s comments, of course. This one is a bit unusual, though, because it didn’t start out as the beginning. It started out as the first part of Chapter 3. Then I was so charmed by Oressa that I made her the primary point-of-view character, demoting the character I thought was primary, and moved her introductory chapter up front as part of this promotion. I think this works well; substantially better than what I initially had in mind. They were talking about her. Oressa, tucked up in the tiny space underneath her father’s chair, hidden by the silk draped over the seat, breathed soundlessly through her mouth, tensed and relaxed all her muscles in turn to keep from getting painful cramps in her legs and back, and listened. Oressa had known her father and brother and Lord Meric and Magister Baramis would be talking about important things. Her father never sent all his servants and attendants away unless he was wanted to talk to his closest advisors about things that were important. Sometimes these things turned out to be boring, as when her father and Baramis spent an hour arguing about whether to compel the dyer’s guild to sell dyes and fixatives at a low flat rate to a favored merchant house that had just brought in a load of Markandan silk – Oressa had vivid memories of being stuck for ages, listening to that argument. She had guessed that this morning’s topic would be more exciting, though. She’d suspected her father would want to talk about Tamarist, or actually the Tamaristan ships in the harbor. She’d been right about all that. But she hadn’t guessed that she would hear her own name appear in the ensuing argument, or in what context. The Tamaristan ships worried a lot of people. Oressa already knew all about that. Everybody knew the king of Tamarist had suffered a stroke or seizure or something and was probably on his deathbed, and so of course everybody knew that the Tamaristan princes were all positioning themselves for the fight over the succession. In Tamarist, the succession was always exciting unless the king declared which of his sons was going to be his heir and had the rest killed, and this time the king had collapsed too suddenly to do either, and from what Meric had said at least three princes looked well-positioned and ambitious enough to try for the throne. So now everybody was worried about Tamarist. There were a lot more ships than usual slipping back and forth in the Narrow Sea, Meric said, and Oressa gathered that lots of them had the slim lines and swept-back prows of warships rather than merchanters, and lots of the sailors who came ashore swaggered like soldiers. But from what she’d overheard this morning, Oressa gathered that Baramis didn’t agree with Meric at all. Baramis doubted Tamarist actually intended to attack anybody on this side of the Narrow Sea. After all, he pointed out, sometimes merchanters did use sleek-lined ships, and many sailors swaggered. Anyway, hadn’t Meric heard? All the Tamaristan ships had abruptly recalled their sailors yesterday and sailed out, so apparently they were going home. Which made sense because every Tamaristan prince ought by rights to be more concerned with the succession at home than with foreign adventures. If the king died and his brothers started fighting over the succession, any prince on this side of the Narrow Sea would surely forfeit his chance at the throne. Did Meric think any Tamaristan prince was both ambitious enough to attack Whetsee and yet not ambitious enough to fight for his father’s throne? Oressa thought all that might be true, but she didn’t like Baramis and she thought he sounded especially condescending this morning, so she was on Meric’s side. And anyway, she thought it would be better to worry about Tamarist and be wrong than not worry and be wrong about that. Meric said all the ships acting in concert that way was not reassuring; acting all together was characteristic of ships under military command, not merchanters. Just because they’d sailed out yesterday didn’t mean they couldn’t sail in back tomorrow. He said a Tamaristan prince might very well consider a foreign base useful as part of his strategy for the struggle over the succession, and if he did, he would certainly think of Whetsee, and especially Caras. Everyone in Tamarist would know the Whetseen guardsmen and militia had been weakened by the plague of the past spring. It wasn’t the kind of thing that could have been kept secret, and anyway nobody had tried to hide it. They hadn’t realized, then, that there would be any reason to keep it secret. The spring plague hadn’t really been too serious. It hadn’t come as one of the creeping red or purple or black mists that got into everything – those were the worst – but as a three-day rain of crystalline cubes, pattering down like fine white salt out of the bright, hot sky. Like salt, the crystals dissolved in water. Unlike salt, anyone who touched the crystals or drank the water in which they dissolved got first fever, and then chills and a higher fever with hallucinations, and then went into convulsions. Finally they died. Lots of people caught it, especially once it got into the city’s cisterns. But it killed so slowly that almost no one had actually died of it. Only hours after the rain finally stopped, the Kieba had sent a great cloud of tiny biting black flies on a stiff wind from her desert. The flies had sparkled in the sun like black enamel and glass and their swarms had hummed in a descending chord of minor notes, so everybody had known right away that the Kieba had made them. Everyone had opened their shutters and doors to let the flies come into their homes. The insects had been especially attracted to anybody with a fever, but they bit everyone. The bites raised ugly welts that itched fiercely, but only a few of the flies would bite any particular person, and anyway both the welts and the itches faded in a few hours. The people that had been ill mostly got better after that, and anybody else who caught the fever mostly didn’t get so sick, and almost nobody died. But even now, months later, the fever’s weakness lingered. People who’d caught it were slow to regain their full strength and endurance, and that meant the guardsmen and the soldiers and the militia, too. Whetsee was much less able to defend itself now than usual – especially in Caras, where the white-crystal rain had lingered longest. So with the sudden scramble of the Tamaristan succession added to the lingering effects of the plague, Oressa wasn’t surprised that Meric thought the Narrow Sea between Tamarist and Whetsee an inadequate barrier. She couldn’t tell yet whether he’d persuaded her father to be worried, too. “It’s awkward for Tamarist to get a large force across the sea, but not that awkward, and if one of the princes wants to establish a foothold on this side of the sea, it’s a good time for him to get it done. And unfortunately all the Tamaristan princes have to know that,” said Meric, summing up half an hour of argument that had struck Oressa, in her cramped position, as unnecessarily repetitive. Gajdosik was the prince they all apparently thought was behind the appearance of those suspicious ships in Caras’ harbor. The king of Tamarist had a lot of sons and Oressa had never tried to keep them all straight. She knew Gajdosik wasn’t the oldest, but she was pretty sure he wasn’t the youngest, either. She dug her fingers hard into the muscle of her right calf, which was beginning to cramp after all, and wondered how much longer this argument would take. Oressa twitched so hard she rapped her head against the underside of her father’s chair, but luckily the sound was covered over by everybody else speaking at once. There was a brief silence. Oressa bit her wrist to keep from making a sound. “My sister is a token concession?” said Oressa’s brother, Gulien, speaking for the first time. Gulien didn’t ordinary say very much during these meetings: their father expected him to keep quiet and listen. Their father said: You should leave the arguing to your advisors, and decide, and then allow no more argument. But Gulien said now, “My only sister? We might think twice before giving Oressa away to any Tamaristan prince, intelligent or otherwise. We might also ask ourselves whether it is so wise to establish a formal alliance with Tamarist, however expedient such an alliance seems at the moment.” His tone was extremely mild, which Oressa knew meant he was furious. Gulien started to say something, his tone sharp, but then he stopped. For a long moment, no one spoke at all. Oressa thought probably her father had put up a hand for silence. There was a murmur of acquiescence, followed by the low sounds of footsteps. The door opened, and the steps moved away. Oressa counted the steps and stayed where she was, bent low beneath the king’s chair, trying to ignore the sharp pain in her legs and the increasing ache of her back and shoulders and neck. “Don’t swear, Oressa,” Gulien said automatically. But then he came to sit next to her. “If Father hadn’t given me leave to tell you tonight, I’d have written it out. Here, let me –” He came up on one knee behind her, and dug strong fingers into her shoulders. Kelian was a young lieutenant in the palace guard. All the palace girls were determined to marry him, but so far he hadn’t shown special favor to any of them. But of course a mere lieutenant who fell in love with the only princess of Whetsee would be too shy to make the first declaration. Oressa knew he was just waiting for her to speak first. Her brother looked at her. “Oh, well, that’s all right, then,” Oressa said. This was probably true. Oressa glared at her brother. “You’d better tell me exactly what he says tonight. Or –” she cut that off. Maybe it would be better if she listened to that conversation herself . . .
“You –” wouldn’t, Oressa meant to say. But her brother looked very serious and she wasn’t sure. Oressa didn’t protest that she already did behave with dignity, most of the time, when anybody was watching. She got to her feet, ignoring the hand Gulien held down to her. Then she brushed the dust off her skirt, straightened her shoulders, ran her hands through her hair, lifted her chin, and put on a proper royal attitude like a cloak, or a mask. “You may check the hallway, if you like,” she said, as regally as she could. And once he had, she strolled away from Father’s counsel room toward her own rooms as though she could imagine nowhere at all she’d rather go. The (next) end is in sight! I’m kind of thinking I can finish the entire first clean-up and cut of the manuscript by Friday. Probably. Certainly by Monday even if things go slower than I expect. I’m going straight through from top to bottom right now, editing and cutting as I go, trying not to keep moving forward rather than going back over and over a scene I’ve just altered. Let it rest, let it go, it’s fine for now, and I know I’ll have better judgment about whether the scene works better LATER. You know what’s weird is when you’re approaching a scene and it occurs to you that of course you should change it in some obvious fashion — edit out a particular character, give an action or piece of dialogue to one character rather than another — and you get to that scene and LO! The change has already been made. I have no memory of editing that scene before. If particularly friendly and specialized brownies are doing my job while I sleep, well, I hope they keep it up. I’ve got it down to 388 pp now; that’s 125,000 words, more or less. Progress! I have to remind myself sometimes that cutting paragraphs and whole pages is still a good thing, I shouldn’t just concentrate on cutting words and phrases — that’s for later. I definitely mean to cut at least 5000 more words, that’s about 15 pages, but three times that would probably be better. So, break time when I get it done! I don’t know about another quart of double-chocolate brownie chunk ice cream, because I try not to do that too often, but I definitely have a celebratory book picked out as a bribe to myself to get this revision done! Five books, actually: I just discovered the Tomorrow series by John Marsden. It’s a set of seven short YA novels involving the invasion of Australia by an unspecified nation. I’ve read the first two and they are SO GOOD. I am so impressed by Marsden’s characters. He has quite a few and they are all distinct and well drawn and the way everyone responds to what’s going on — perfect! I love his plotting, which is tight and clean. And his writing is great, it just disappears so you can fall right into the story. And I think it was so clever of Marsden to avoid specifying the bad-guy invader nation. Honestly, there IS no possible real-world candidate for a nation that both could and would invade Australia, and he totally side-steps this whole problem by just deciding up front not to try to shoehorn a country that couldn’t work into that role. That is so much better than trying to twist things around to make something work when it couldn’t. So, anyway, I’ve got the other five books ordered and they should all be lined up in a row waiting for me just about exactly at the time I finish this revision. Can’t wait! Not that I’m crazy about deer, they stomp all over my planting beds with their sharp little hooves, and they treat my gardens like their own private buffet . . . but . . . Okay, I have to admit, that’s pretty cute! 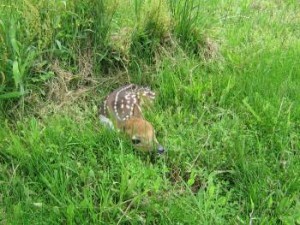 This little critter was tucked a foot away from the vegetable garden fence when I took this picture. Naturally my mother asked whether its mother might have abandoned it, and luckily I was available to say, as firmly as a conservation agent, NO, THE BABY IS FINE, THE MOTHER IS FINE, LEAVE WELL ENOUGH ALONE. Which we did, and in fact this little guy has been back, finding hiding places here and there around the house. Under a smoke tree, for example, right next to the house. My dogs have no idea or they’d go nuts. At this age — the hide-and-freeze age — fawns have little to no scent, so predators have a hard time finding them, and that includes my dogs. Luckily there are the cicadas for the dogs to chase, so they’re not too deprived! I’ll post a piece of my current WIP pretty soon . . . I’ve cut 32 pp so far, condensing three of the early chapters into two — that was a big and very necessary job. I’m still in the clean-up stage, and will be for a while. But yes, I did really enjoy my celebratory quart of double-chocolate brownie chunk ice cream, after finishing the rough draft. I ate it while reading a YA dystopian novel that’s kind of getting some buzz — Divergent, by Roth. Both the ice cream and the book were very good — an important plot twist that I predicted didn’t happen, or hasn’t happened yet (maybe in the sequel? ), and I’m still deciding whether I think that’s good or bad (it was a neat plot twist, and I’m not sure I believe that it could fail to happen given the way Roth set up her characters). Do all popular YA dystopian novels have to be written in the first person? Roth did a fine job, it’s not that I was bothered by the first person pov, but I’m wondering whether young readers today expect / depend on / need the first person narrative in order to connect to this kind of dark-ish dystopian novel? Or are authors just following the herd? Haven’t decided that yet, either. So a few weeks ago I mentioned I was going to make a lot of different kinds of chocolate chip cookies, each purported to be the BEST CHOCOLATE CHIP COOKIE IN THE WORLD, and have a taste test. So, seven cookies — pretty paltry, but enough for a first wave of testing, right? The recipes varied in whether they called for shortening, butter, or margarine (yes, one called for margarine specifically); in the proportion of white to brown sugar; and in the use of oats and / or nuts. I used top-quality Gheradelli chocolate chips for all the cookies. They’re by far the best chocolate chips I know of — I did my own taste test for chips first. We actually had a tie between a pretty ordinary cookie with one interesting twist and a very unusual cookie. Just in case you’re interested in trying out some fantastic chocolate cookies, here are the winners! These are from an article I saw someplace that featured them as The Best in the World. I don’t remember where I saw the article, but I googled Lindsay’s Chocolate Cafe, and it turns out it’s in St. Louis, so it may well have been a local newspaper or something. These are basic chocolate chip cookies, but very good. The use of butter rather than shortening and the inclusion of walnuts and grated chocolate are what set these apart. Shortening is used in lots of chocolate chip cookie recipes, including the (quite decent) Tollhouse Cookie recipe. It gives a good texture to the finished cookie, but of course misses the butter taste, which is one reason I think Lindsay’s cookies were one of my winners. And the standard directions for cookies: Combine the dry ingredients, cream together the butter and sugar, beat in the eggs and vanilla, stir in the chocolate chips and walnuts and grated chocolate, drop on cookie sheets and bake at 375 degrees for 10 minutes or so. Now, the weirdest recipe, also a winner and my personal favorite! I have no idea where this recipe came from. Some ingredient or combination of ingredients gave these cookies this fantastic chewy texture. If you don’t like graham crackers, try these anyway — the graham cracker taste morphs into something completely different and far superior when used in these cookies. Beat together the butter and condensed milk. Combine the dry ingredients and stir in. Stir in chocolate chips and English toffee bits. Drop on cookie sheets, back at 375 degrees for 10 minutes or so. I always line cookie sheets with parchment paper, and I definitely suggest it here, as I suspect the toffee bits would stick if the sheets were unlined. 424 pp total, don’t remember the word count, but it’d be something like 140,000 words. Too long! At least, too long for this story, quite a lot longer than I want it to wind up. So! First, the clean up, then the first cut, then the final read-through-and-cut, and then I can send my newest baby off to be read by objective, analytical eyes . . . always a trifle nerve-wracking. However, before that, I think a quart of double-chocolate brownie-chunk ice cream is in order. And what’s the point of really good ice cream unless you have a really good book to go with it? I need to pick up a copy of Veronica Roth’s “Divergent”, which I read the first chapter of a week ago and have been dying to get back to. How ’bout that for a recipe for a rewarding evening?